Air source heat pumps have become increasingly popular with self-builders in recent years. Rising fuel bills and stricter regulations have made alternative heat sources more viable and popular. GreenGenUK is among Cornwall’s most experienced air source heat pump installers, having worked with the technology for nearly a decade and with 100’s of installations throughout Cornwall. As a result, GreenGen has seen the same questions repeatedly crop up from customers considering an installation. Here, we try and clear up some of the most common air source heat pump myths. Will a heat pump keep my property warm? The key to an efficient heat pump is correct sizing. A well-sized system will provide all a home’s heating and hot water demand and be cost-effective to run. Air source heat pumps will comfortable heat a property in temperatures well below 0. Air source heat pumps are only suitable with underfloor heating, right? This is true to the same extent it’s true with gas or oil heating but air source heat pumps work efficiently when installed alongside rads, too. Underfloor heating operates at lower flow rates. Meaning water running through the pipe isn’t as hot as water flowing through radiators. This decreases the strain on the system and slightly improves efficiency, regardless of heating system. There’s no right or wrong with radiators or underfloor heating, budget and personal preference often dictate the decision. OK, but I’ll need larger radiators with a heat pump, won’t I? To an extent, yes, but only by 10-15%. Air source heat pumps distribute heat at lower temperatures than non-renewable boilers. Size of the radiators should be considered to ensure rooms get to temperature in a suitable time. Having undersized radiators will impact warm-up time and it’s important an installer considers this. What’s an SPF or SCOP? Seasonal Performance Factor (SPF) or Seasonal Coefficient of Performance (SCOP) are a rating of a heat pumps efficiency by stating how much heat a system provides per unit of electricity consumed. Furthermore, SPFs and SCOPs consider seasonal variations and differentials for space heating and hot water to give an efficiency rating over the course of a year. Air-to-water heat pumps provide hot water storage through a cylinder. On the other hand, air-to-air heat pumps do not provide hot water and need a supplementary system. What’s the life expectancy of an air source heat pump? Heat pumps are renewable alternatives for gas and oil boilers. Therefore, they have similar life expectancies. Air source heat pumps have a 20-year life expectancy. In addition, they often come with a 5+ year warranty. Where can I site my heat pump? Air source heat pumps should be sited within 15 metres of the property and inside a metre of the property’s boundary. Minimising pipe runs between the external unit and the internal cylinder is the aim. 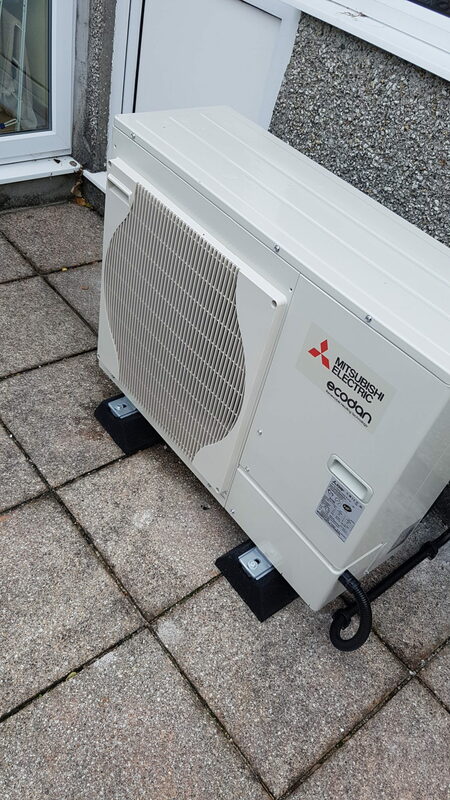 Air source heat pumps usually sit next to an external wall. Is there any subsidy on Air Source Heating? Air source heat pump installations are eligible for government subsidy through the Renewable Heat Incentive scheme. However, eligibility criteria apply. The scheme pays customers for the heat their system generates over a seven-year period. How much you earn depends on the individual property and the efficiency of the system installed. As a self-builder, can I claim RHI payments on my heat pump? Self-builds, or custom-builds, are eligible for an incentive from the RHI scheme, providing they meet Ofgem’s criteria. Customers using their own money to finance the build are eligible. Development sites are not. Installation companies will be able to advise on this.